Hidden by the drama of Toronto’s housing market, inappropriate government action, big debt, and International trade threats, something amazing has been happening in Toronto, Canada. Major US tech companies are making plans for locating in Toronto. Microsoft, Uber, Google are among them. The reasons are many and the trend is strong. The opportunity for Toronto is a sustainable market leadership in global technology. 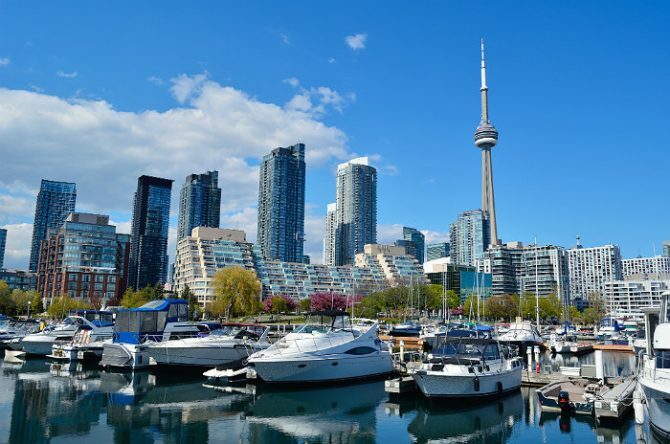 Since the US economy is booming and jobs are being pulled back into the US from overseas, a dominant position in the North American IT sector, Toronto has a grand opportunity. With such high cost of living in the US and political turmoil there, the traditional brain drain to the US, might actually reverse. Why the push North? Cost advantages, lack of available talent in the US, high skilled talent availability in Canada, liberal trade agreements with the world, and Canada is free to import more tech talent from India, China and Eastern Europe. A safe, high quality lifestyle, with excellent career opportunities await in Canada’s cities. A thriving tech startup community (including Mars) further shows T.O. is ready to become a world technology hub. Amazon, Google, Facebook and other tech giants will take the opportunity seriously because they need the talent. 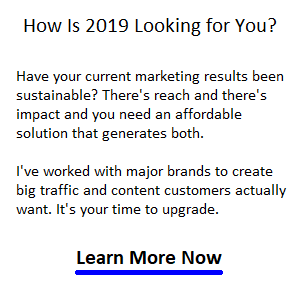 We may see some big announcements in 2019/2020. If you’re hunting for a job, planning your tech career, or considering a tech startup, BlogTo lists some of the major tech conferences you might attend in Toronto in 2019. 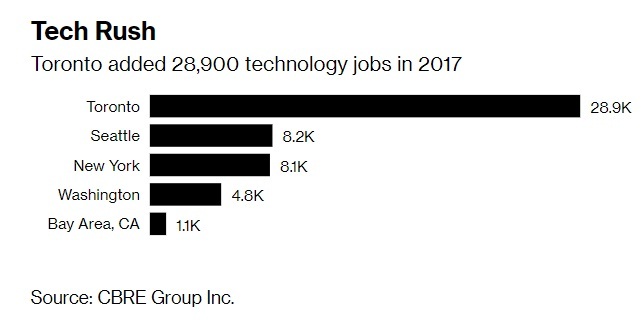 Bloomberg recently reported the city had just leap frogged other big US tech hubs such as Silicon Valley, Seattle and Washington in the number of new tech jobs. In 2017, CBRE released their study findings that Toronto has been drawing a good number of tech talent. With the USD CAD exchange rate so favorable, you’d think Toronto would have an unbeatable advantage. Yet apartment rents in Toronto are high. “This is absolutely sustainable growth,” said Palmer, pointing to what he called “a critical mass” of talent, companies and research in the GTA and the Kitchener-Waterloo region, as well as a relatively healthy venture capital market, and support from government-supported hubs such as the MaRS Discovery District. “Toronto is a very attractive market.” says Doug Palmer, BMO’s VP of Commercial Banking. Cost is a significant and increasingly crucial matter for companies in the tech sector. The cost of operating in San Francisco is twice that of Toronto. Toronto is much less costly than even the cheapest US locations. Apartment rental costs, and wages too play a role. Average annual wages in Toronto were reported at $62,000, half of that in Silicon Valley. CBRE found that 28,900 tech jobs were created in 2017 (latest year reported), 14% above 2016’s total, for a total of more than 241,000 workers. That’s a serious improvement of 52% over the past five years. Toronto is rated 4th in tech talent power, but is it about to march to number one by 2024? And is there a commitment from government to support tech in Canada? Please bookmark this page, as I’ll be updating it with the 2018 numbers and reporting on tech job trends in Toronto, Ottawa and Vancouver. Vancouver is notable too, since it also has a thriving tech sector . The growth in the tech sector in Toronto could weigh big on the future location of a Canadian based headquarters of Amazon. As Toronto’s reputation for tech, and commitment to enabling technology businesses of all sizes from startups to mega-sized tech leaders grows, the rate of growth will improve. Canadian banks are flush full of cash and the Silicon Valley North opportunity is not lost upon them. With global growth slowing, Canadian banks are more likely to give Canadian small businesses a chance again, something they’ve never done. This is a golden opportunity to build a sustainable leadership in the world’s number one business sector. U.S. based Silicon Valley Bank, which focuses on tech startups and venture capital firms is locating in Toronto with the intention of financing 40% of Canada’s tech businesses. 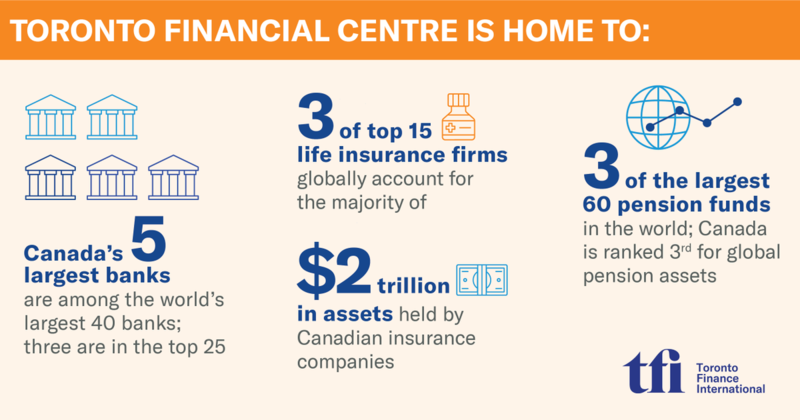 They seem pretty certain that Canada is headed for big things and they’re hoping to jump ahead of the risk averse Canadian banks. If Andrew Sheerer wins the October election, there might be a tax reduction put in place, and that might start an avalanche of tech business in Toronto and Ottawa. 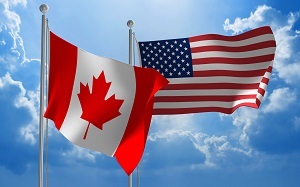 As the US economy heats up again, with wages rising, full employment, and worker shortages, the push will be on to locate tech operations in Canada. President Trump’s restriction on US immigration leaves global tech workers to alternatively select Canada to emigrate to. Currently, technology labour makes up 8.9% of total labor force. Ottawa, Canada’s capital city is also competing for tech business and tech labour makes up 11.2% of the workforce there. 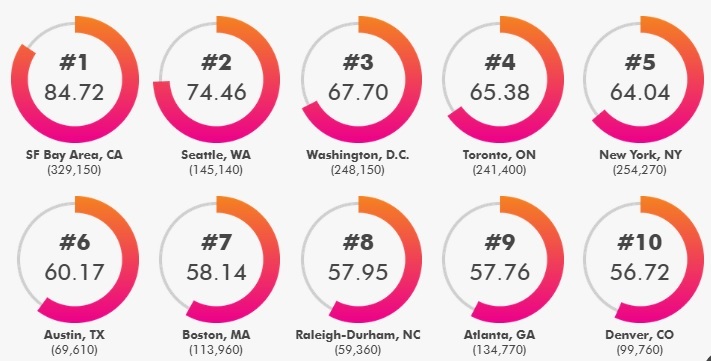 Ottawa has a higher rate than Silicon Valley or Washington DC. CBRE’s report found the quality of tech workers in Toronto is very high. If Canadians had an inferiority complex about IT 5 to 10 years ago, it’s quickly disappearing as they get to know the level of education available now. University of Toronto, York University, Ryerson University, and even University of Waterloo are pumping out a variety of tech talent. Ontario’s colleges (Seneca College, Georgian College, Humber College, and Centennial Colleges, are adding to the pool of excellent technology workers. Canada’s liberal immigration policies are likely playing a role in bringing in some talent. That door could be opened wider. The situation is the US is further exacerbated by congestion and resistance by those in congested New York, San Francisco, Washington, and Seattle. Jeff Bezos for instance is entertaining changing his H2 decision because of resistance in New York. NYC doesn’t want the added pressure on its housing market. Supply and demand factors in housing supply and rental prices are forcing businesses to look to Canada where possible. The only question is, is the talent present in Toronto, Ottawa, Montreal, Waterloo, Calgary or Vancouver? And how will this growth affect Canadian housing markets including Toronto’s own real estate market? 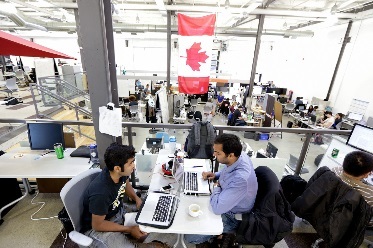 Is Toronto’s burgeoning tech sector ready for global leadership? Leave your comment below.